These play systems are designed specifically to cater to children of all ages. 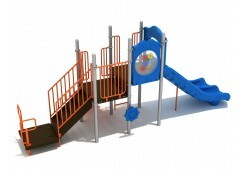 They have the same exciting slides and climbers of play systems made for older kids, as well as all of the important safety features needed for young kids to use them. They are built lower to the ground, and have barrier panels (which often have built-in activities) to block off all elevated ledges. With these versatile play systems, you won’t have to designate and build separate play areas for preschool and grade school aged kids, saving you time, money, and space. These are the perfect structures to delight children of all ages, and since most of them are ADA compliant, they are also perfect for children of all levels of physical ability. Since we offer such a wide variety of different models in this category, you’re sure to find the perfect one for your specifications, budget, and play area.